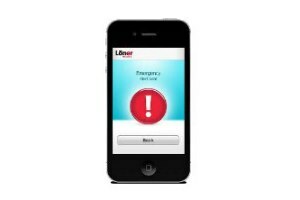 With the Loner® Mobile app for smartphones, your handheld Blackberry, Andriod or iPhone becomes a convenient Blackline-powered employee safety monitoring device. Using your smartphone data connection and internal location technology, Loner Mobile conveys the safety status of employees to monitoring personnel, similar to Blackline’s dedicated safety monitoring solutions, Loner® SMD and Loner® IS. Available to enhance the capability of Loner Mobile is Blackline’s Loner FDU accessory that provides employees with safety monitoring component with which to interact. Including True Fall Detection®, activity monitoring, an Emergency Latch, and Silent Emergency button, Loner FDU achieves a more comprehensive safety monitoring solution. Loner® FDU is an accessory to use with the smartphone application Loner Mobile. Designed to enhance overall employee safety monitoring capability. With Bluetooth® wireless communication and by pairing the Loner FDU with a smartphone running the Loner Mobile app, Loner FDU supports Loner Mobile with features including an Emergency Latch, True Fall Detection®, No-Motion (man-down) Alert, Silent Emergency (duress) Alert, and Missed Check-in Alerting for added protection.